I’d just like to say, writing from down here in the doldrums of February (where I start a blog post every few days but can’t seem to finish one – bad blogger! ), I have rarely loved any appliance as much as I love my Hubbibi’s Robot Face. Have you ever slept next to a snorer? More to the point, have you ever tried unsuccessfully to sleep next to a snorer? If you answered yes, then you know. And if you have found yourself listening and wondering, “HOW ON EARTH is any oxygen getting in? ?” then I bet your snorer has sleep apnea. I can vouch. For the past two nights, poor Sean has been too congested with a cold to wear his mask. It’s like watching an animal drown with only a flimsy blade of grass to rescue it with: struggle struggle struggle to get air, then every other minute, breathing actually stops and you nudge to get it going again… then it goes right back to struggling. And musically, it’s like listening to a very sick blender. You can’t imagine anything worth breathing is really getting into the lungs. It’s painful (for me). And this is how sleeping has been for him – for years. We don’t even know how long he’s had the condition, but he knows he has been mostly tired for a very, very long time. He is one of those people who would fall asleep sitting up, in the middle of a social occasion – and no wonder! If not enough oxygen is getting through, the body is not resting properly. It does not get replenished as it should. Anyway, since the arrival of Erin Flo (as I’ve just decided to call her), life is Different. In our darkened bedroom, all I hear is the very soft hum of Flo’s mechanism – a comforting, steamy sound – and my beloved husband breathing. Properly. It’s frickin’ awesome. Furthermore, he feels better. Despite the fact that he’s getting up at 4 a.m. on weekdays at the moment, he has more energy and acts a lot less like a narcoleptic. Between us, based on this experience, we feel confident that a large percentage of common afflictions can be blamed on this subtle and insidious condition. Who knows how many people out there suffer from depression, apathy, listlessness, lack of hope/positivity/energy/motivation etc. etc. – just because they aren’t getting a good sleep?? We think it’s a LOT. The robot face is worth it. I actually have a photo of Sean sound asleep in the middle of a party! I am glad the robot face is helping. Thanks for blogging I have indeed been missing it as though I would my nostrils! Heather’s Vader mask is awesome. Breathing is a good thing. SUCH a good thing. Is Heather’s mask badass black?? i slept beside a really, really terrible snorer fro about 20 years, and wished most of that time that there was some cure. the sleeping partner gets to lose a LOT of sleep, too – mainly wondering whether the partner is going to take the next breath, but also lying there as you did wondering whether anything valuable to the body is making it past all the apparent obstructions. it is upsetting, scary, nerve-wracking and sleep disturbing. 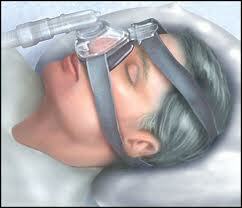 apnea is really a debilitating problem! i agree that not getting enough (quality/quantity) sleep is probably the stem of many different problems. i am really happy for you! hooray for you both!! life is bound to improve. You’re right – hard on both partners, for sure. And that’s a LONG time, a lot of sleep lost! I’m so sorry. Robbie, Ben, are you reading this???? Hey, what causes Sean’s sleep apnea? Is it something you’re doomed to have forever, or can changes in lifestyle/sleepstyle help get rid of it or something? I guess I could just go read about this somewhere… or maybe it would be an interesting question for Dylan. It seems that for so many problems, NDs have answers and ideas of causes and solutions that regular people have never heard of. They do say that many people have less need for their masks after losing weight, but I don’t know if that’s always the case. Sean has it coming from both parents, so he’s predisposed for sure.